After an enjoyable venture into the card making word, I am back with the usual, a bright layout of my kiddies. Surprise. Surprise. This layout has been inspired by a sketch. 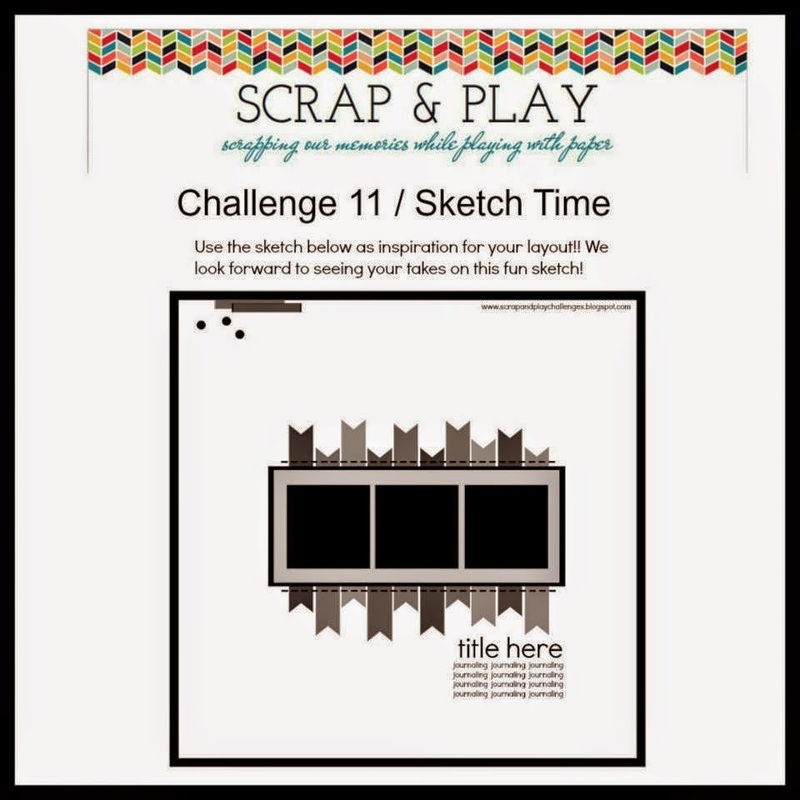 This time from Scrap & Play a fairly new scrapbooking challenge blog. The challenges vary from colour combos, words plays and sketches. Challenge #11 is the sketch below. For this layout I have used only Bella Blvd. 90% from the Molly collection. I was totally shocked to discover that I had not used ANY of it yet. Well that certainly had to be fixed! I fiddled with different supplies to create the 'banners' behind the photo strip from the sketch, I considered paper strips, washi tape, flowers and finally decided on the feathers. Thought it was something new to try and had the perfect colours to match Chloes dress. Also because of the dress I had to include at least one flower. The Baby Blooms from Bella Blvd where again just perfect for the page. I didn't have a title in mind when I created the page, so it was a last minute. The 'everyday girl' die cut was again just what the page needed, as these are just photos of Chloe that I like. Thanks for checking out my layout. Love how you added feathers instead of banners! She is adorable and so is your layout! Thanks for playing along with us at Scrap & Play! ohhh just love how you used the feathers here!!! Thanks for playing along with us at Scrap & Play!